ISUtrecht is a close-knit and welcoming community of students, staff and parents, who share a common goal: to create a stimulating learning environment in which everyone feels at home. The school currently caters for over 700 international students and will grow to 1200 students in the next couple of years. The staff is international, enthusiastic and extremely capable. ISUtrecht is an International Baccalaureate World School authorised to teach the IB Primary Years Programme, Middle Years Programme and Diploma Programme. ISUtrecht is a Dutch International School. 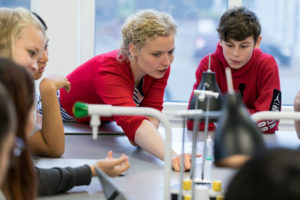 All three Teaching Assistant vacancies have been filled and there are currently no primary vacancies for August 2019. Please note that one of the secondary mathematics teacher vacancies for August 2019 has been filled. To stay up to date with ISUtrecht vacancies, please follow the school on Linked-In.